If you don’t have the time to wrap a bunch of gifts, the solution may be a holiday gift box that takes care of the wrapping for you. Featuring whimsical Santas, Christmas trees, snowmen, and presents, this Christmas gift box will delight any recipient who receives it. You can skip the wrapping paper while still keeping the holiday spirit alive. Tie a ribbon around the box, put a bow on top, or keep it plain - it's up to you! This two piece cardboard box is 10 x 12 x 3 inches. It can easily fit gifts of all sizes: from clothing, to accessories, to games, books, and more. 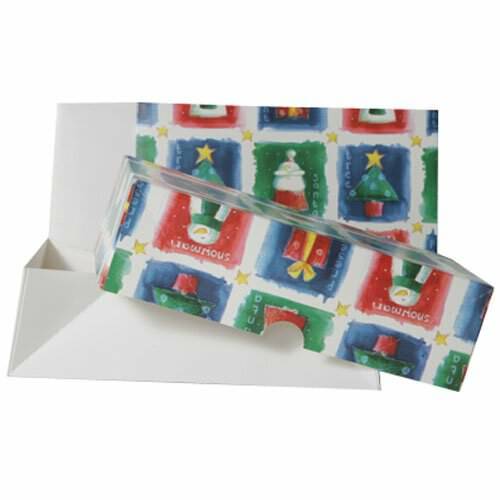 The cardboard material is sure to keep all and any gift safe and secure all the while being festive and fun. Give any gift an extra festive touch by placing it in a Christmas themed box. Want another size? Check under 'Other JAM'n Products You Might Like' for two other options!